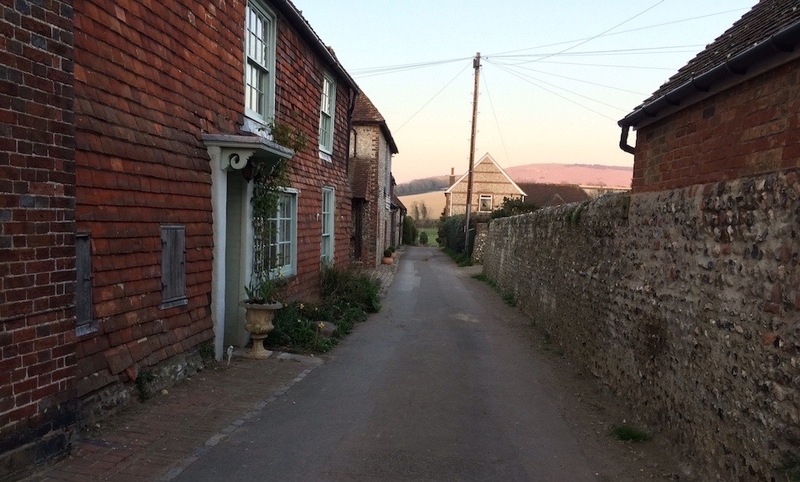 There are few prettier villages in Sussex than Alfriston and it is just off the South Downs Way, so a perfect place to take a bit of time out for an overnight or longer. 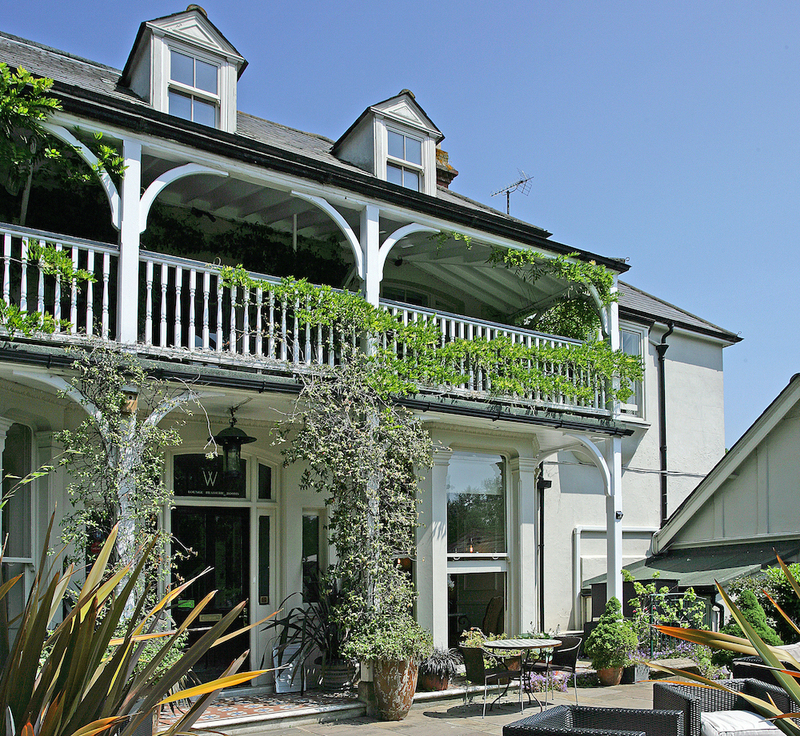 Wingrove House, a boutique hotel or ‘restaurant with rooms’, in an attractive 19th century colonial-style mansion sits at one end of the high street overlooking the green known locally as the Tye. 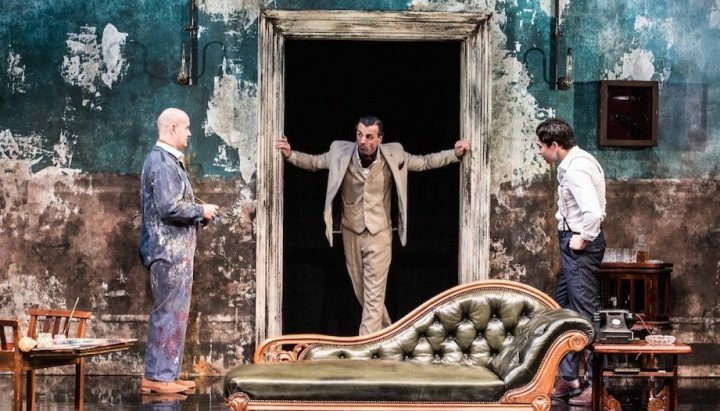 ‘Summery (it’s got a lovely garden terrace) and probably pricey’ were my preconceptions but I was very wrong. 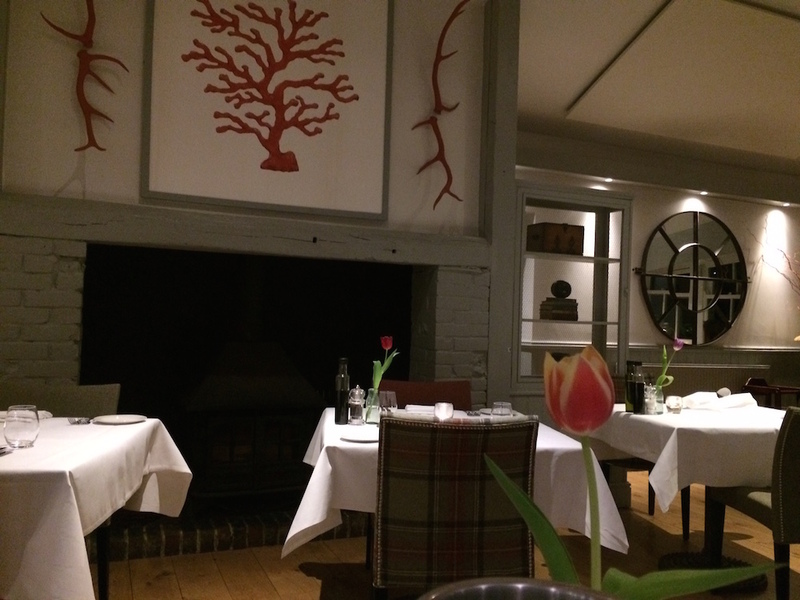 It’s lovely and cosy inside for cooler times, the food is reasonably priced and there are some great deals like the current midweek April Stay and Dine offer. My husband and I checked in for an overnighter at the end of March. 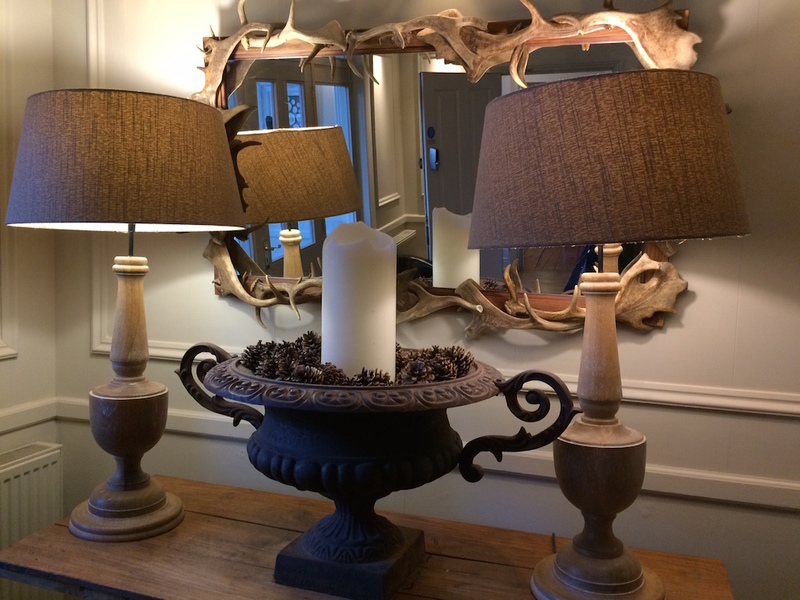 Some of the quirkier detailing was the first pleasant surprise, like antler picture frames and shell and twig displays. There are also pressed plants framed in the hallways. 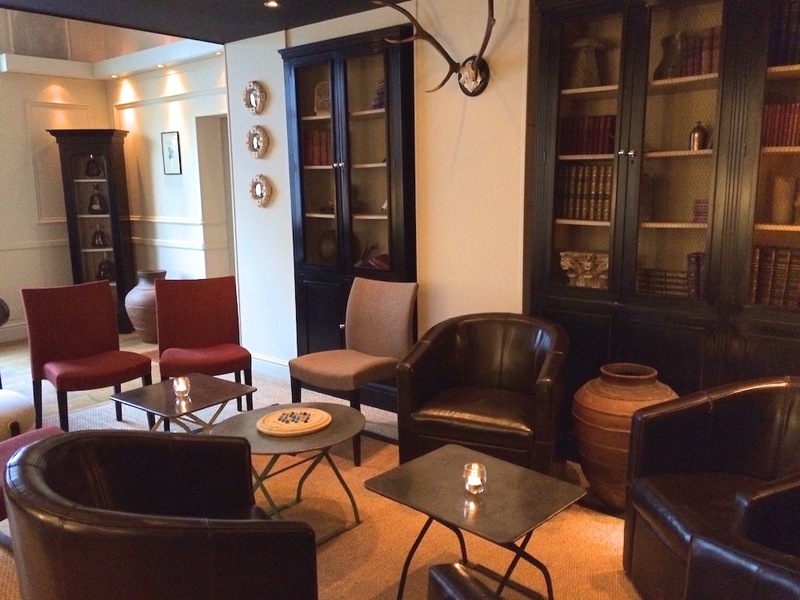 The lounge area was cosy and roomy, including a large fireplace and, coupled with the terrace and the size of our room, it became obvious this is somewhere you could extend a stay. Free on site parking is another tick point. 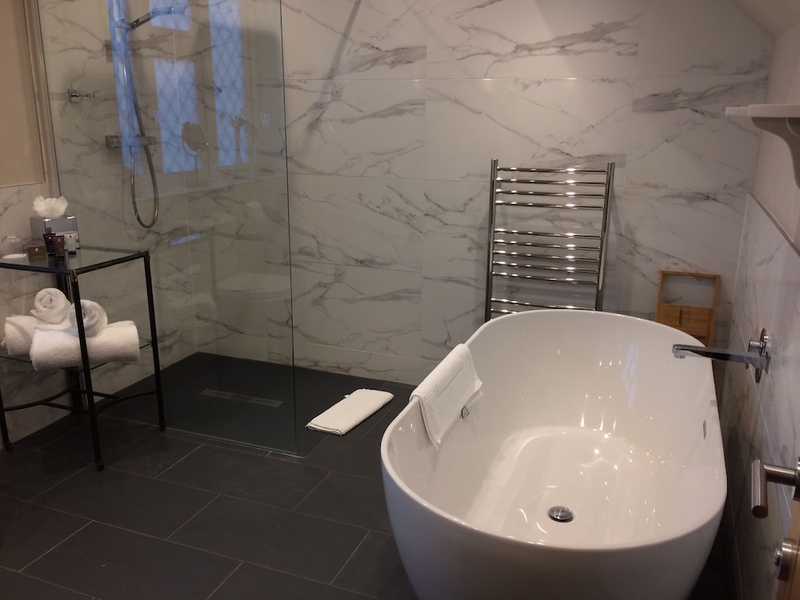 Our room, a premium deluxe, had a large bathroom with twin sinks, a monsoon shower and free standing bath that even had a fun wooden gadget to lay over the top with a space to clamp your book and stow your wine glass. My idea of heaven! The bed was super squishy and comfortable with a thick duvet. Lights were dimmable and everything had a smart modern finish. Some other rooms, up in the eaves, have balconies and feature original beams. Of course you don’t need to stay to eat here and there’s plenty to tempt you in. There are light lunches, beautifully presented dinners by night, and a traditional Sunday lunch at the weekend. 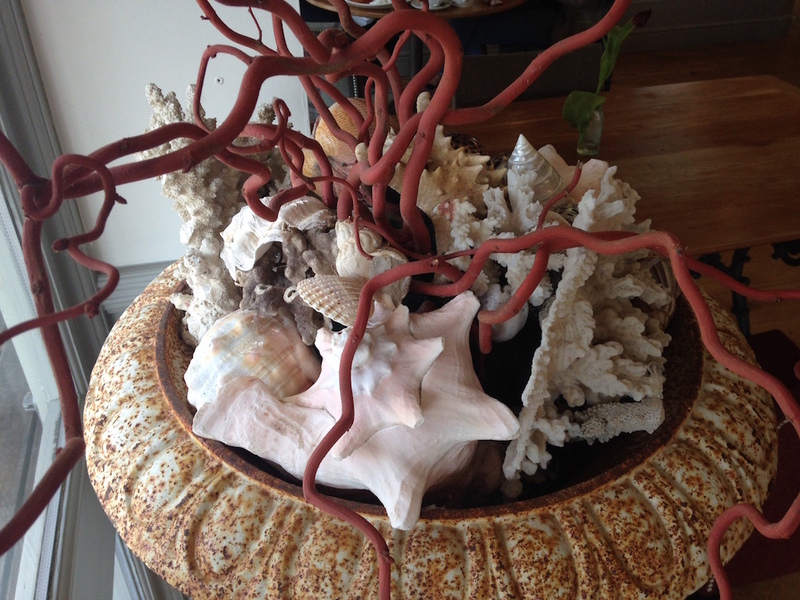 The dining room is stylish but unpretentious, with friendly service. 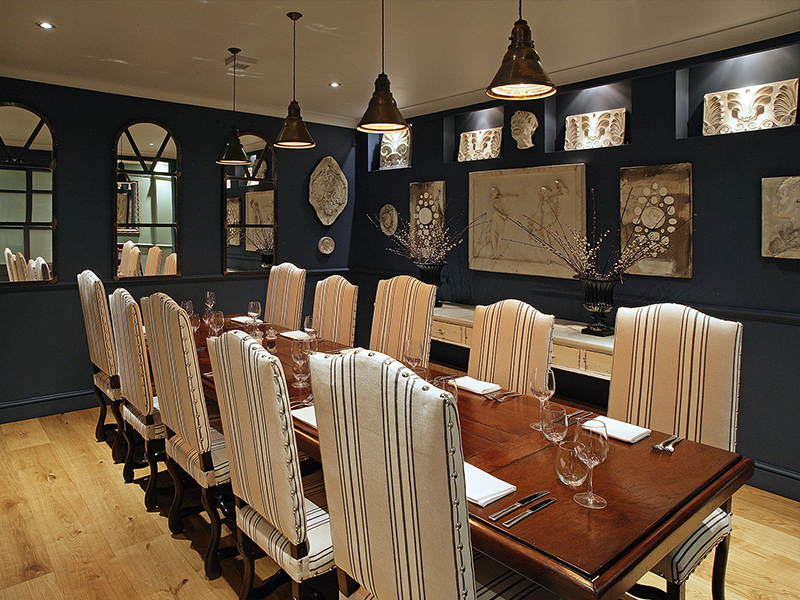 I had a peek at the smart private dining room just off the main one and it looks perfect for celebration or business dinners. We arrived ravenous and ready to dive in to the menu. 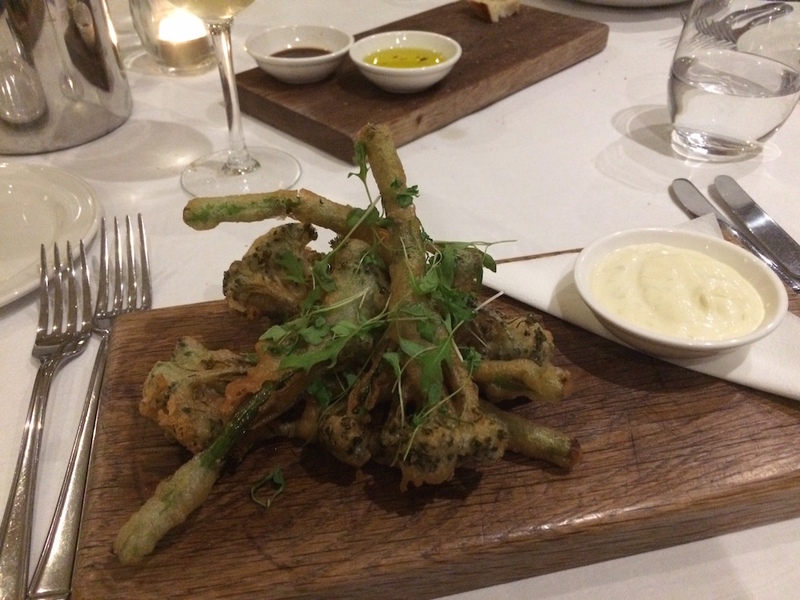 To start I chose the intriguing Gin and Tonic tempura broccoli – which was perfectly al dente and came with a really zingy lemon and lime mayonnaise. 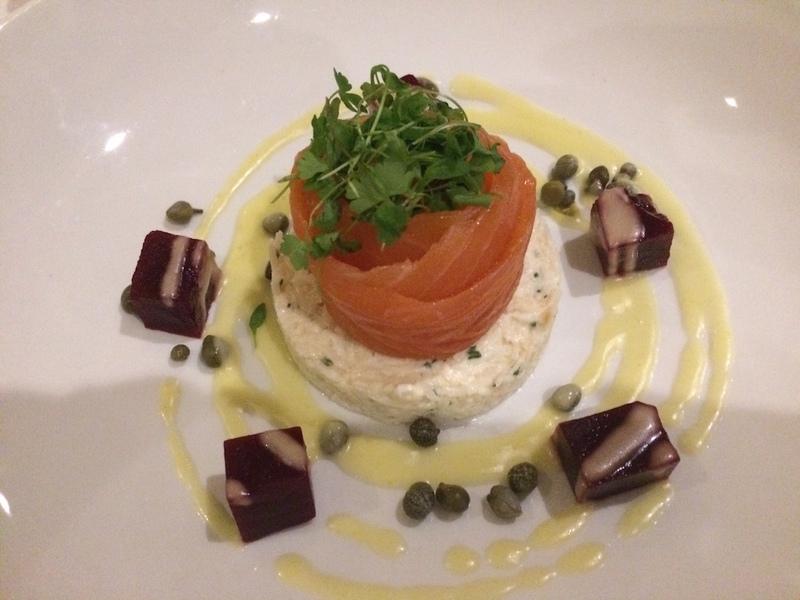 My husband had the smoked salmon, celeriac remoulade (easier to eat than say) with pickled beetroot cubes he particularly liked and a lemon and caper dressing. 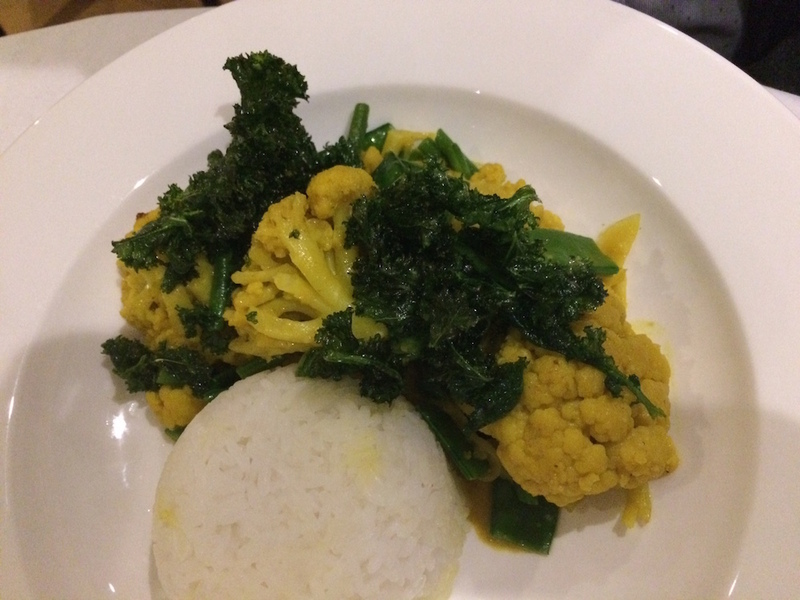 His main was the Thai vegetable curry – not particularly Thai but with crispy kale, cauliflower and other virtuous seasonal greens. 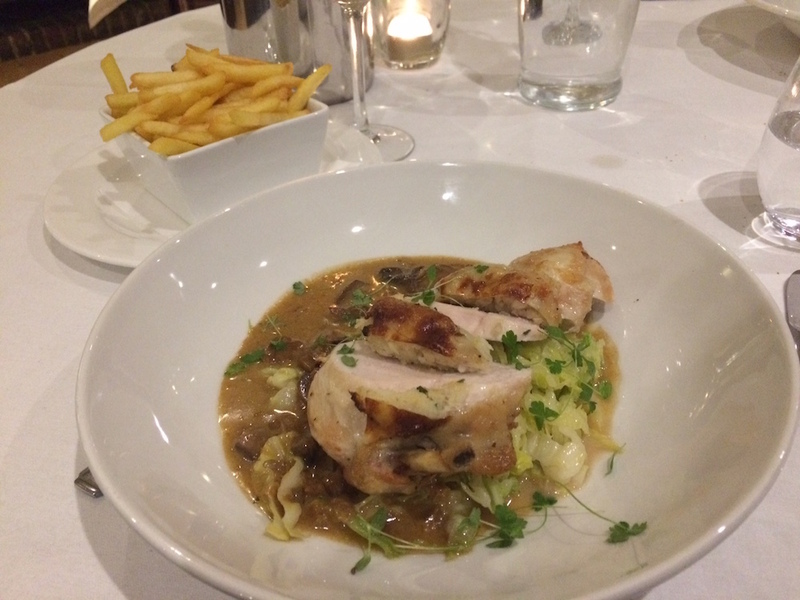 I went for the breast of chicken with lemon stuffing, savoy cabbage and a very good mushroom and tarragon sauce accompanied by perfect french fries. Steak, lamb and hake with clam chowder were among other options on the night. The food comes from local sources, organic where possible, and I liked that the suppliers were detailed on the menu. 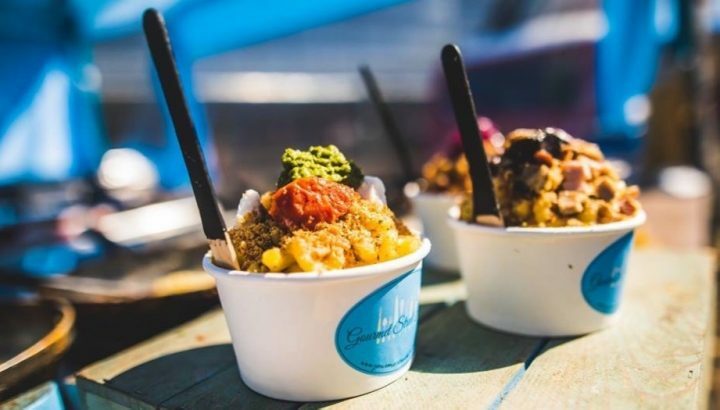 Head chef, Mathew Comben has plenty of experience and once worked at the Hungry Monk of banoffee pie fame. No banoffee on the desert menu at Wingrove while we were there but some other very tempting choices. 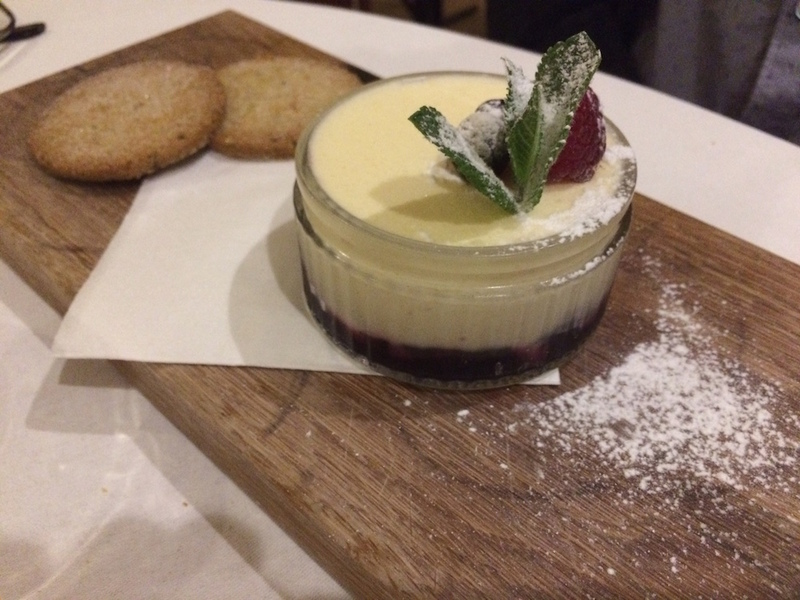 Mr Muddy, a Lemoncello fan, went for a chilled lemoncello mousse with blackberry compote layered in the bottom and pistachio shortbread on the side. 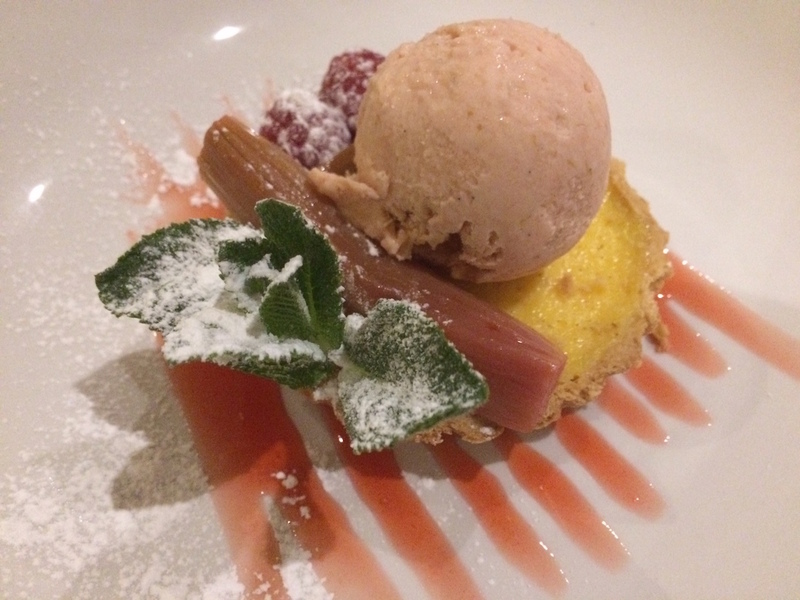 I had a fabulous custard tart with tangy fresh rhubarb and an excellent homemade rhubarb ice-cream. It all worked beautifully together and, being a child of the Seventies, I had the Roobarb and Custard theme tune as an ear-worm all night! The next morning we made the most of the spring sunshine sitting reading on the small terrace outside our room – enough for a couple of chairs, which looked over the back of the hotel onto the Tye. We had a leisurely breakfast back in the dining room, also with a Tye view. 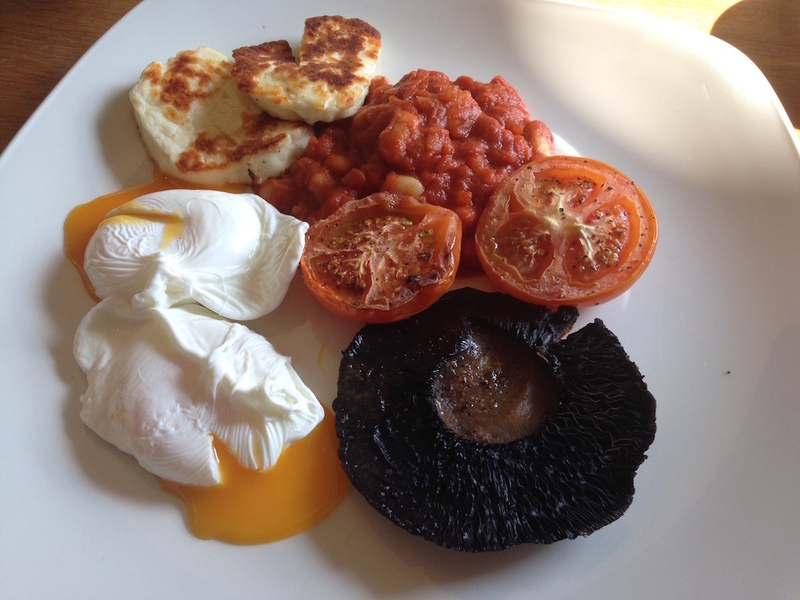 I went for the veggie full English with toast on the side and it was one of the best I’ve had in a long time, with grilled halloumi and homemade baked beans. (Carnivores can go for the full works including black pudding). My other half went lighter with the smoked salmon, scrambled eggs and sourdough. 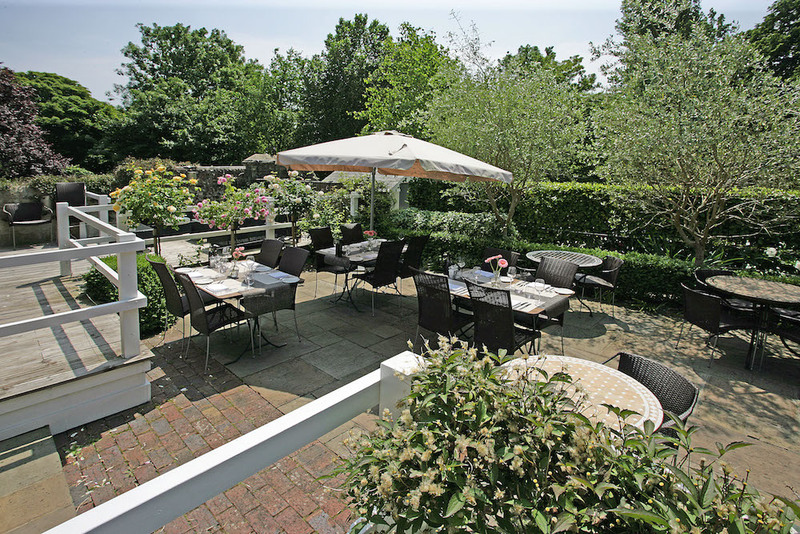 Lunch, bites, afternoon tea or drinks can be taken out on the terrace in warmer weather. You can walk up to the South Downs Way from the village (grab a picnic lunch from deli in the back of the village store). 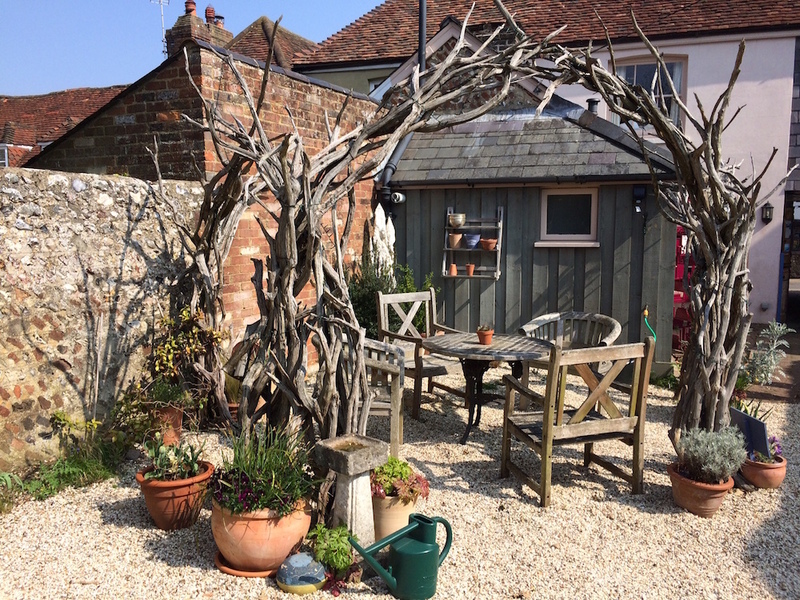 Lingering in Alfriston, you’ll find a couple of very old timber framed pubs and some smart boutiques. 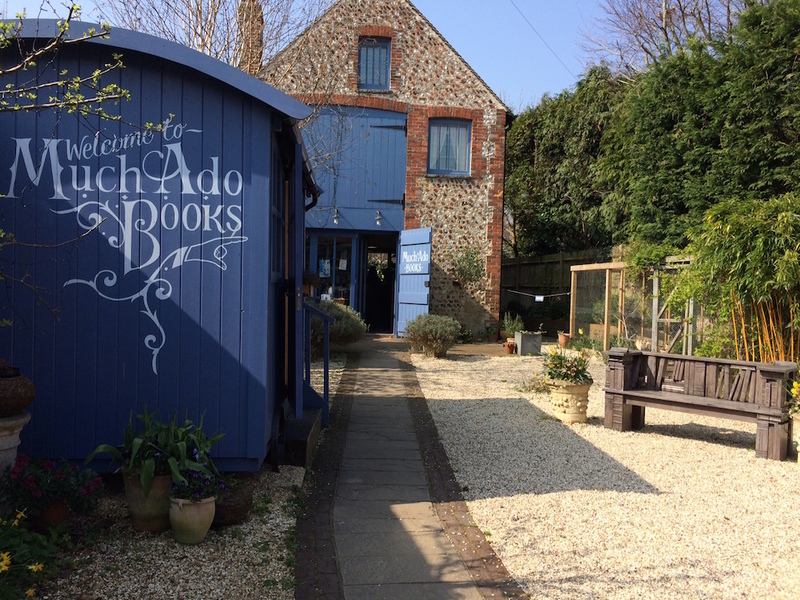 Don’t miss Much Ado Books – the gorgeous bookshop in a beautifully recently converted barn and its courtyard with free range hens. The original shop alongside is now used for workshops and activities supporting the owners’ commendable charity Prospero’s Project. The 14th century Alfriston Clergy House is within a few metres of Wingrove House and, fact fans, was the first ever property bought by the National Trust. Rathfinny vineyard is just a little further on from Wingrove – a lofty spot (pause for the view to Cuckmere Haven on the drive up) for wine tasting, tours and walks. 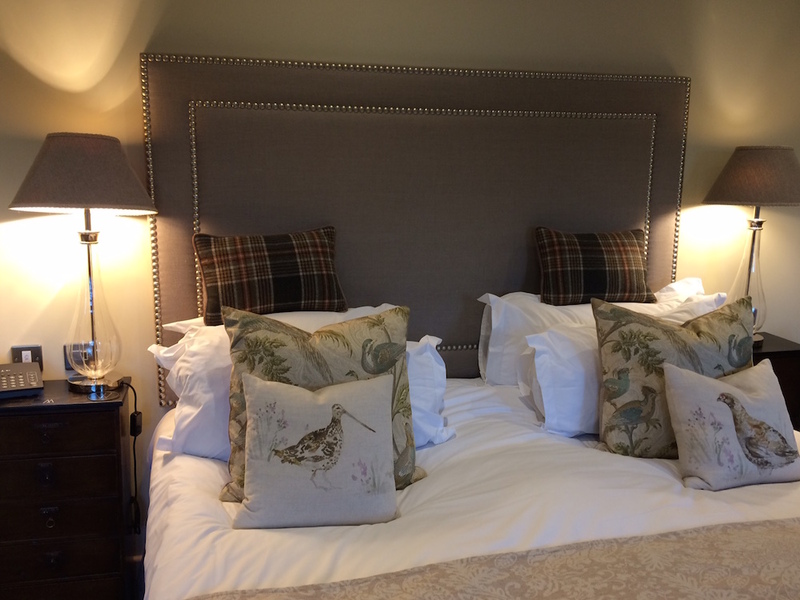 Wingrove House has a special package on Wednesday and Thursdays in April linking bed, breakfast and dinner with a tour and lunch at Rathfinny from £110 per person. If you’ve children with you you’ll find Drusillas handily just outside the village and Arlington Bluebell Walk (open Mid April into May) is not far away. 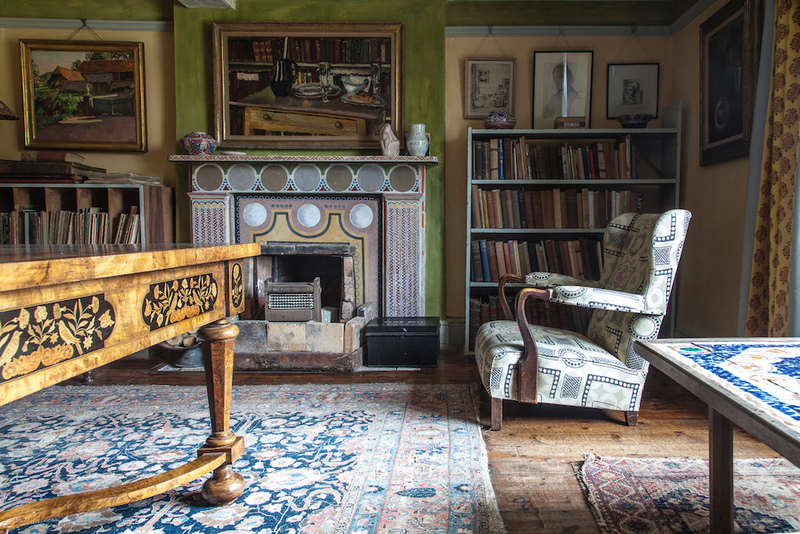 Charleston House – home of the famous literary festival and offering craft workshops and tours, is also in the wider area, as is Firle House. We spotted Steve Coogan on his way into Alfriston in a sports car as we left – so it has Hollywood approval! 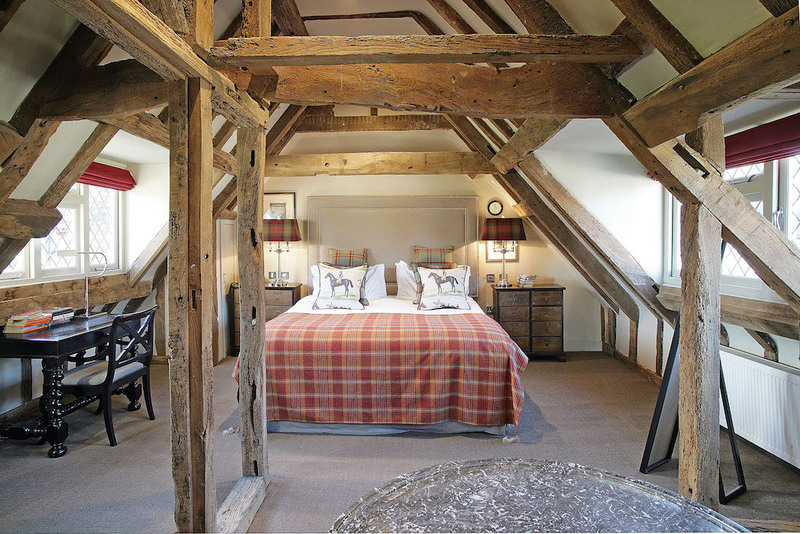 Good for: A romantic break – either overnight or up to a week. 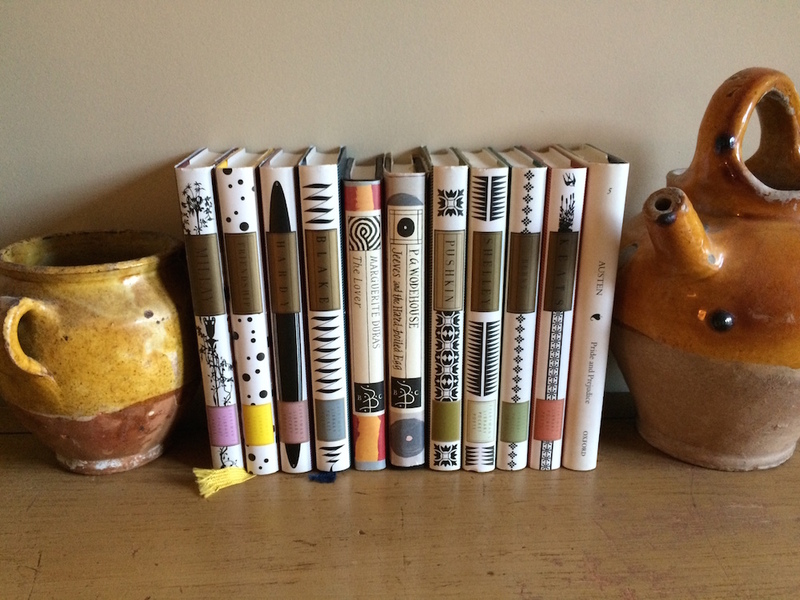 A base for a staycation visiting nearby attractions or walks in the South Downs. Lunch, dinner or afternoon tea in a lovely setting, with dining on the verandah in warm weather. Celebrations with extended family. There are high chairs for children in the restaurant though it’s not really the right ambience to take them for an evening. For family stays the new three-bedroom self-catering Wingrove Lodge nearby is perfect. Not so good for: Though there’s free wifi at Wingrove there’s poor phone signal in the village so phone addicts be warned! Obviously this is a low key kind of place so it’s about relaxing, walking and browsing round boutiques, not partying. ££ Mains are £17-£22, starters £6.50-£9, desserts mostly £7-£7.50. Look out for set menu deals. 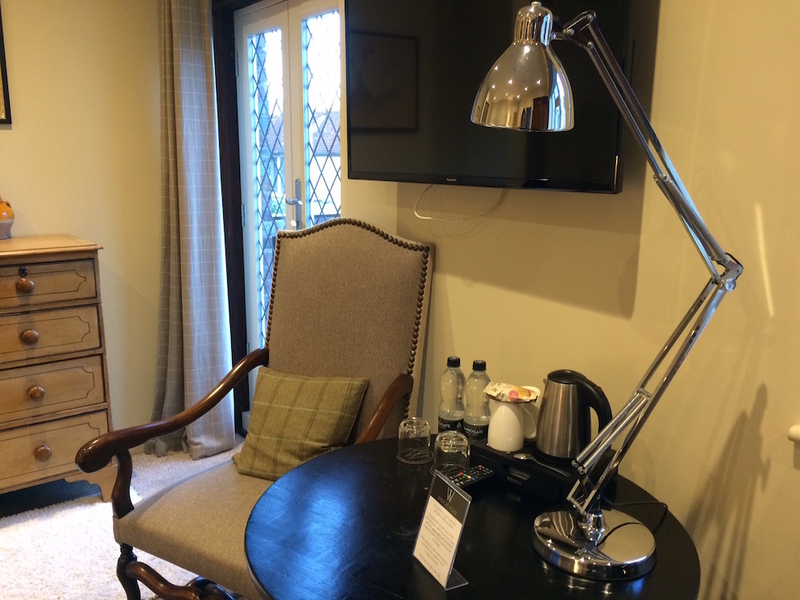 Rooms with breakfast are from £100-£125 in low season (Nov – Jan), £125-£155 in Mid season (April, May, Sept, Oct) and £150-£165 in high. 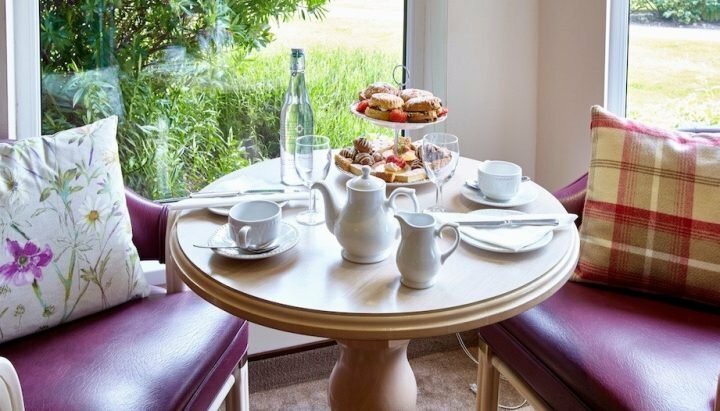 April 2019 Stay & Dine Offer: Book a two-night midweek break and get a three-course dinner for two for free on one night of your stay Sun – Thurs from 1 – 30 April 2019, except 21 April. (Drinks excluded, not in conjunction with any other offer and subject to availability).